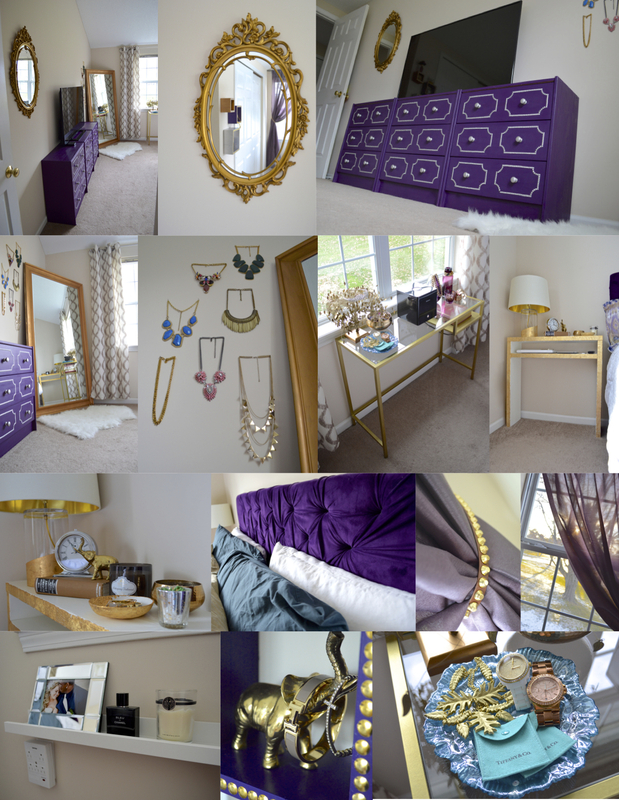 When my gold-dipped lamp was featured on Better Homes + Gardens, I realized that our master bedroom has changed quite a bit since we first re-did it at the beginning of the year. 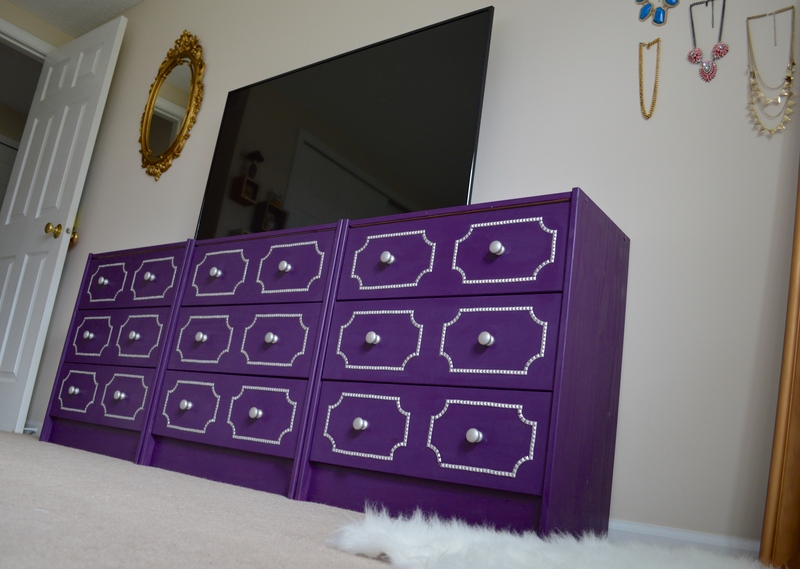 We got a new tv, made some new furniture, added some things + removed others so I thought it would be nice to do a updated post to share with you all how it’s looking now! Not much has changed in the entry way to the room as that side of the room is my favorite. 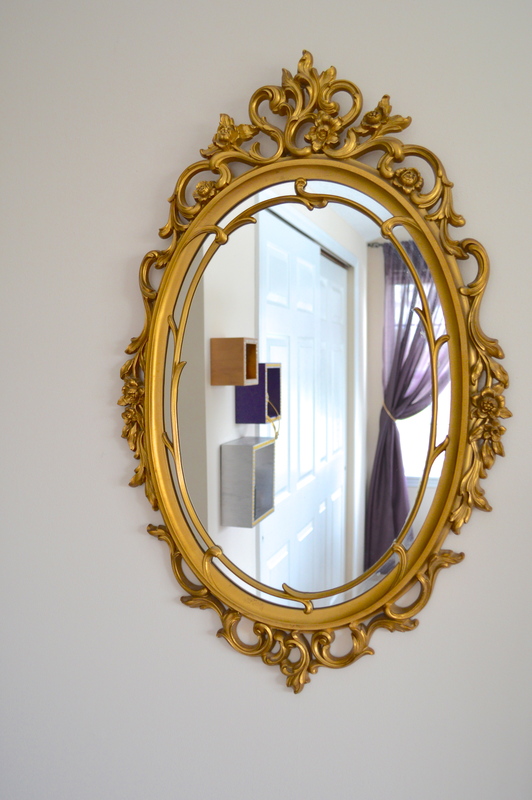 I love the vintage filigree mirror I found at a theft store for $5. There is a floor length mirror in the other corner but I like having one right by the door so you can catch a final peek as you head out! 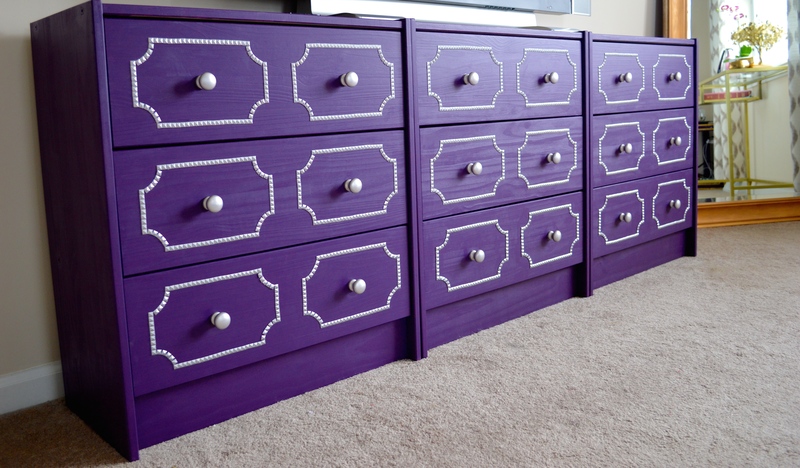 I am happy to say the studded dresser that we made from three unfinished wooden dressers from Ikea is still good as new! I am shocked at how well it has held up. It’s a bit of a pain to dust because it is wooden and when you try to swifter it, pieces of the duster get caught on that and the studs but I’ve found a little pledge duster spray on a microfiber cloth does wonders! Our old tv (which was ancient) finally kicked the bucket so we replaced it with one that is 10″ bigger but much thinner. The base is smaller as well so it fits on the middle dresser top alone and since it’s so thin it sits flush against the wall so I don’t have to worry about it tipping forward. We chose not to have cable upstairs so the only plugs are from the TV + the Apple TV and both are behind the dressers to keep the cords hidden! Next to the dresser we have a giant six foot by three foot mirror that sits in the far corner of the bedroom. 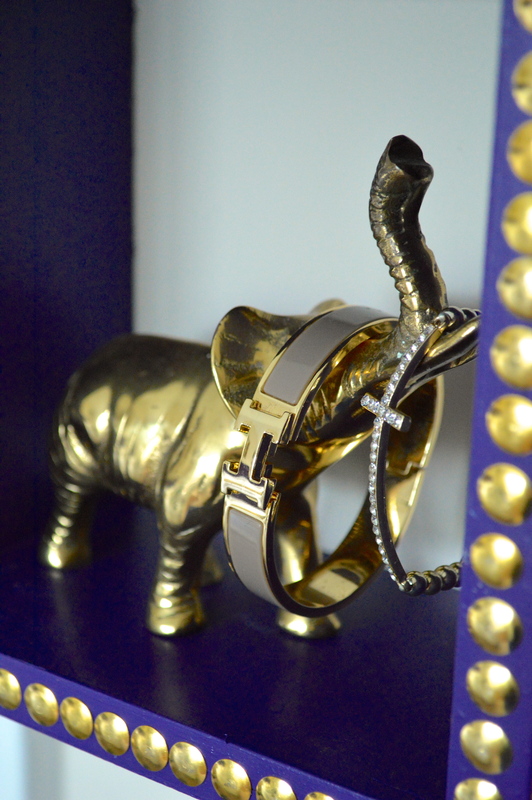 This is one of my favorite things in the room. Not only does it look cool but it’s so functional that I don’t know how I’d live without it! I got the mirror at Kirkland’s when we first moved into the townhouse but it was black so I painted the border with this gold leaf paint. They have one at Kirkland’s now that’s super affordable and already gold if you’re looking to add one to a room, find it here. 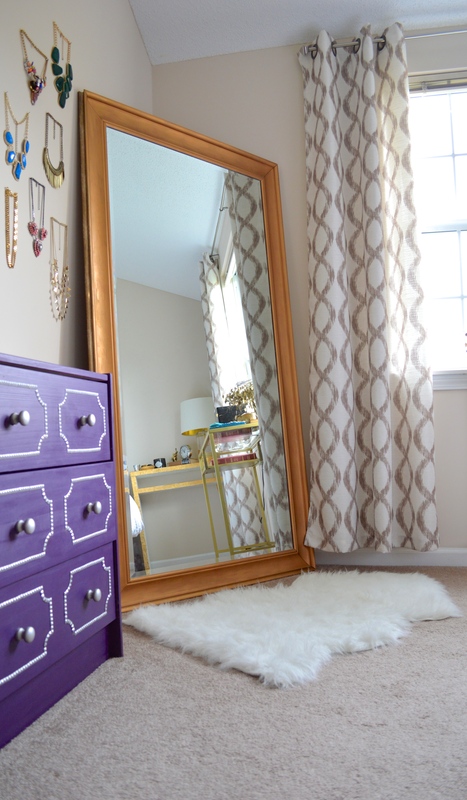 The little faux sheep skin rug in front of the mirror can be found here. 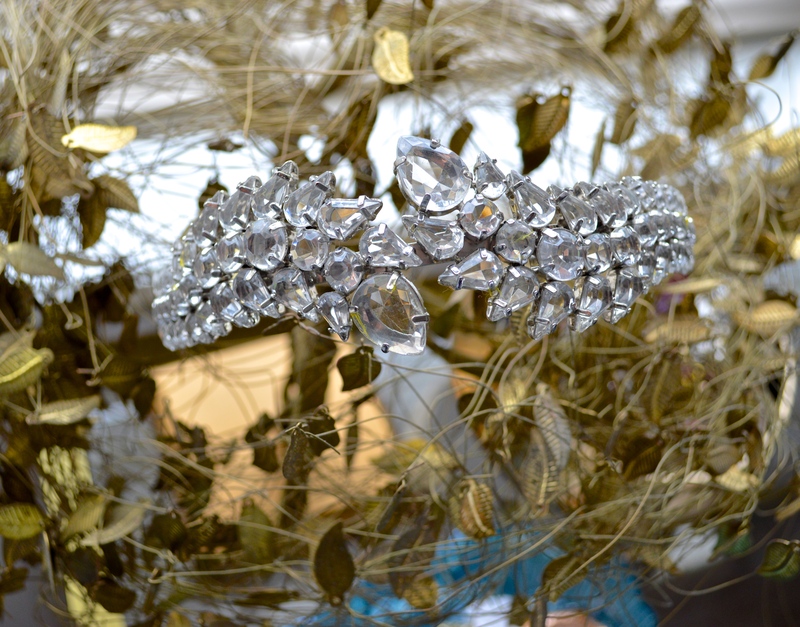 I had been putting my bigger statement necklaces on a glass plate on the console table (which is coming up soon in this post!) 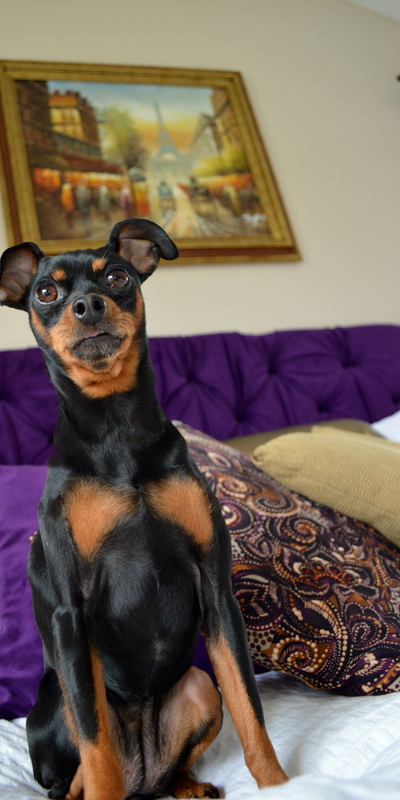 but I had too many of them and they were cluttering up the table. 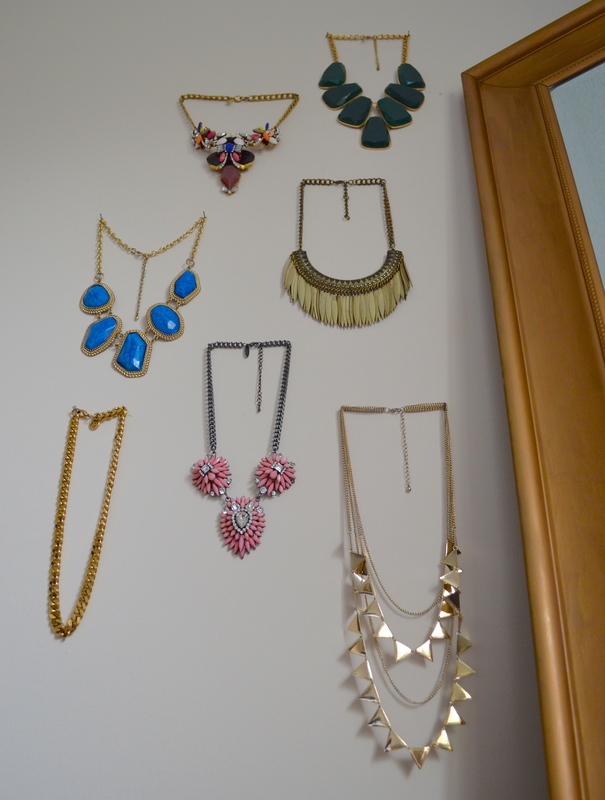 I decided since they were statement necklaces after all, why not display them. 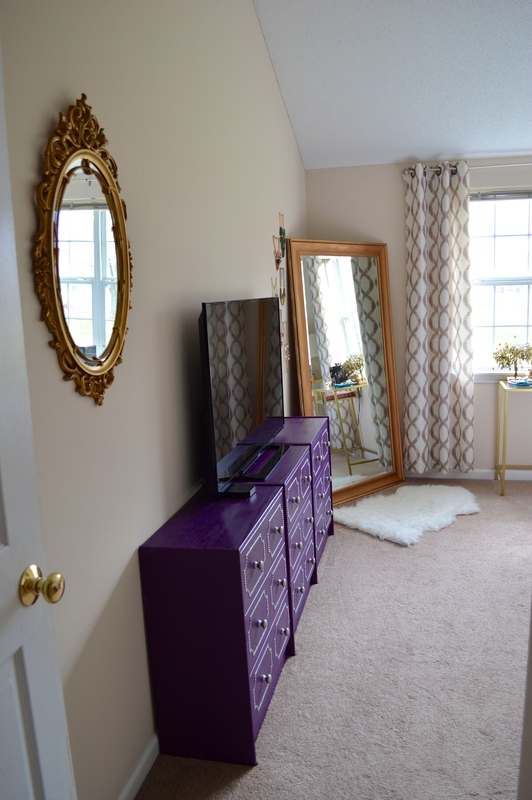 This killed two birds with one stone, it freed up space + also added some design to the blank spot in between the TV + the mirror. I used tiny brad nails + a level to make a little display. The same curtain panels are still along both side of the double windows on the next wall. 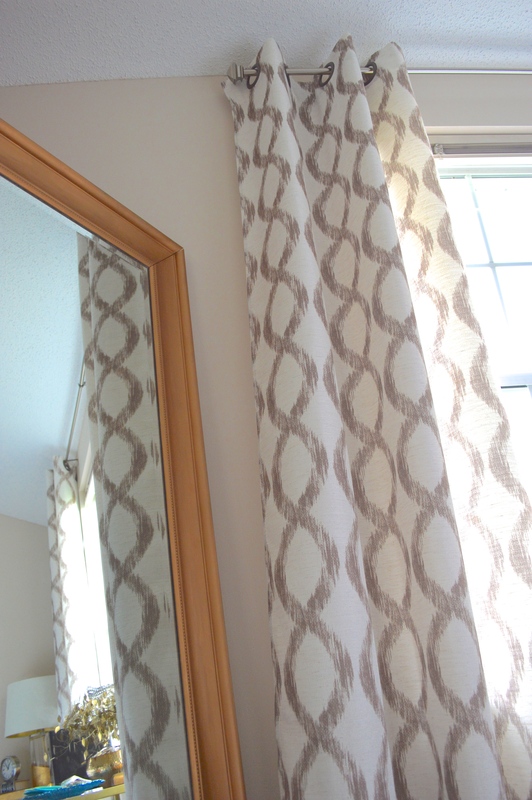 I hung the curtain rod all the way up at the top of the wall near the ceiling to make the windows appear larger. 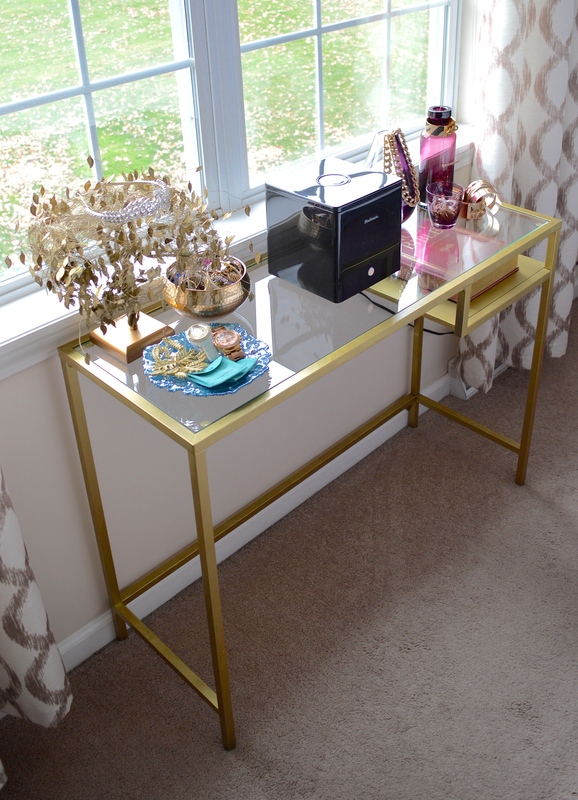 Along the next wall is a double set of windows and the console table that I made from a laptop desk. Everything is basically the same on the table except the orchid has been replaced with a small box ultrasonic humidifier. 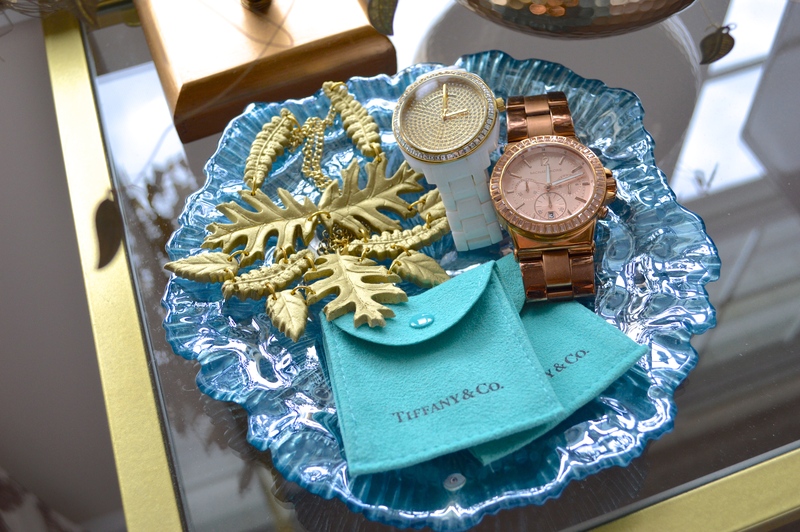 I still have the twinkle tree that’s the same one my grandmother had in her room while I was growing up, the luster glass plate + the larger hammered brass Nate Berkus bowl to hold jewelry. I also still have the purple striped vase, the purple milk bottle + the purple votive holder (all from Ikea) on the other side of the humidifier. 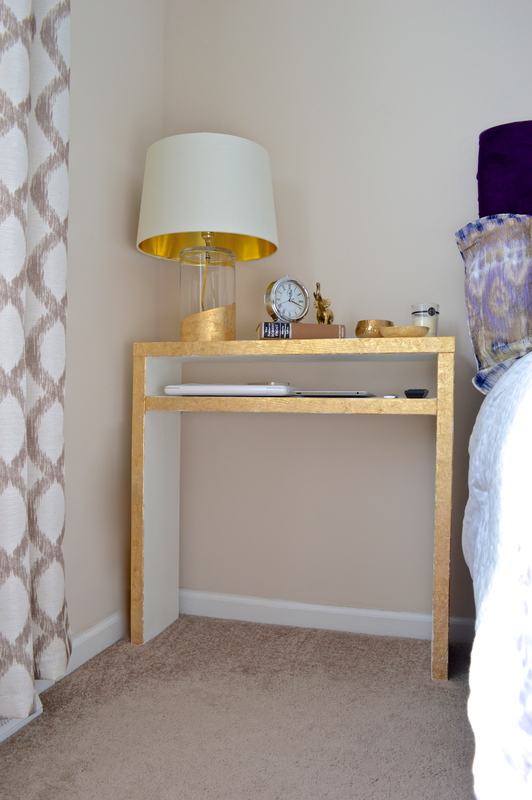 We replaced the nailhead trim cube table that I made with the white + gold console table I made next to the bed in the far corner of the room. I love having this table because it’s thin enough that it doesn’t take up a bunch of space but it holds everything I need. I took the picture ledges down that were above the nailhead table because this one is so much taller. 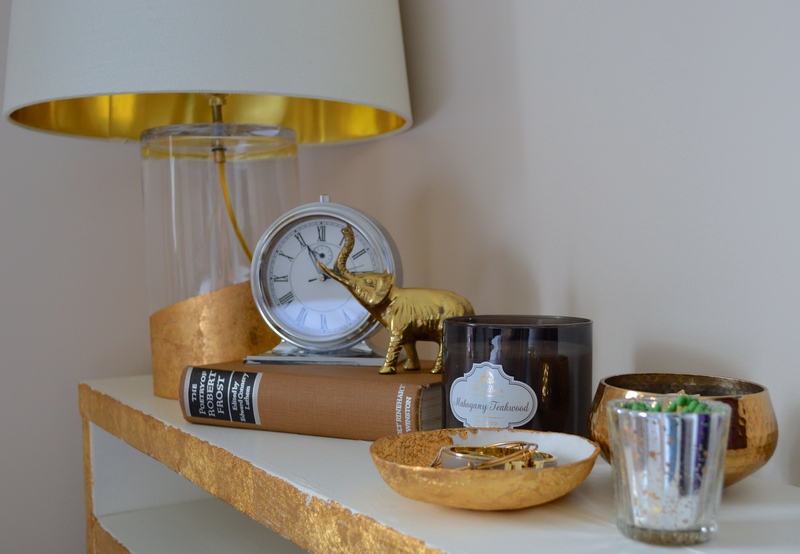 I have my DIY Gold-DIpped Lamp along with some other items including my DIY clay jewelry dish + a votive to hold matches for the candle that I made like my matchstick bottles. 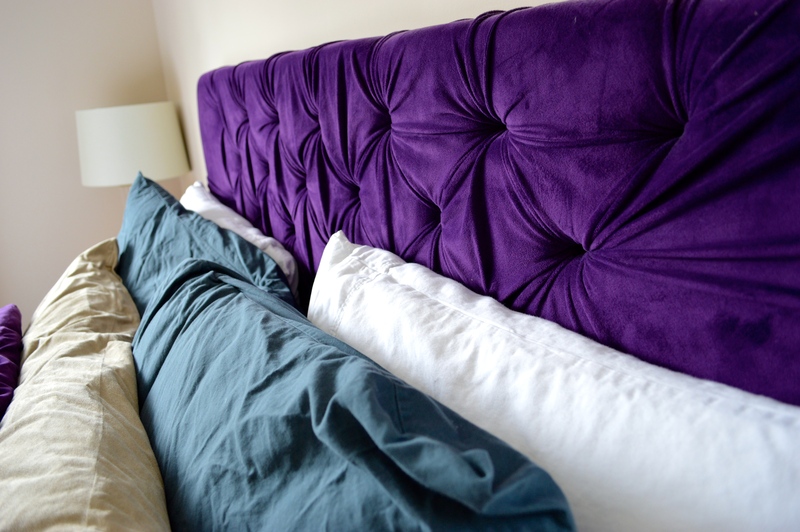 The DIY Tufted Velvet Headboard is still going strong above the bed, I still can’t believe we made it! The painting of France is still hanging on the wall above the bed + we have switched back to the fluffy white duvet instead of the Nate Berkus ikat set because we needed something heavier for the winter months. 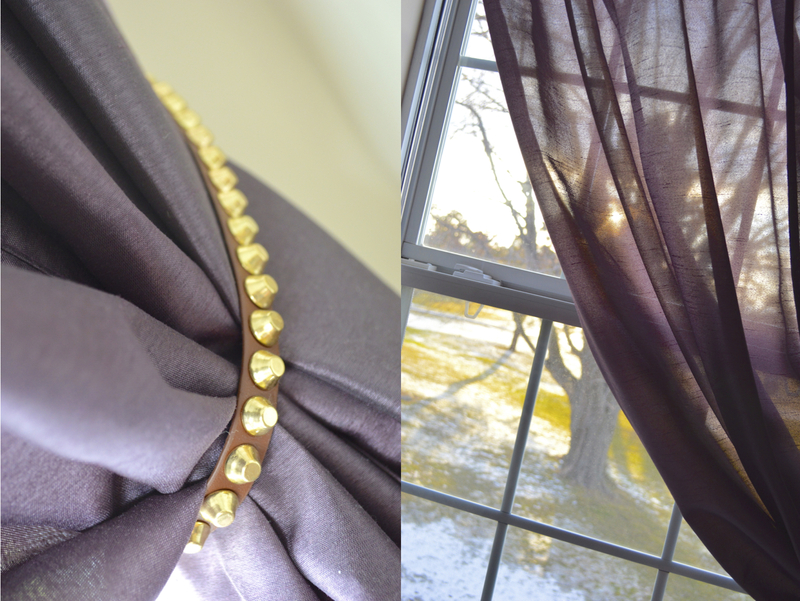 The sheer curtain panels, which I swooped to one side + secured with a leather studded wrap bracelet + a nail is still on the single window on the other side of the bed. I took one of the picture ledges that was above the table on the other side of the bed before and hung it under the window. It’s perfect over there with an outlet right underneath it, You can plug in your iPad and iPhone and lean it right on the ledge to charge overnight. 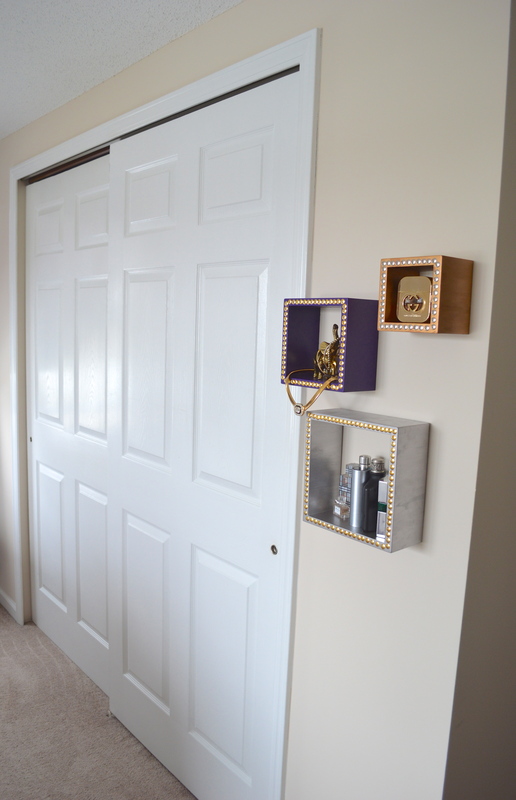 The cubes I painted and studded with thumb tacks are still hanging next to the closet and holding our perfume + cologne.